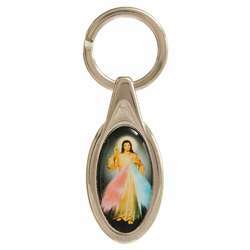 In this category we have gathered all the religious objects dedicated to the devotion of Jesus Mercy revealed by Christ himself to Saint Faustina Kowalska. 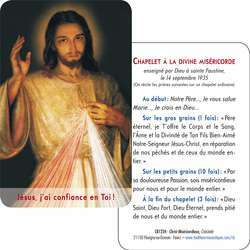 Card-prayer of Merciful Christ of Cracow (detail) with the back le chapelet à la Miséricorde Divine. Sold per quantity of 50. Card-prayer of Merciful Christ of Madi with the back le chapelet à la Miséricorde Divine. Sold per quantity of 50. 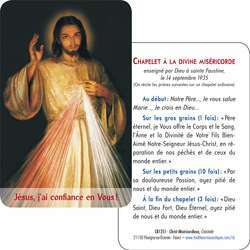 Card-prayer of Merciful Christ of Vilnus (detail) with the back le chapelet à la Miséricorde Divine. Sold per quantity of 50. 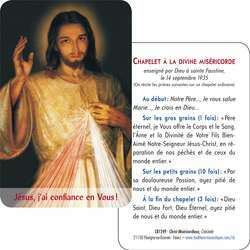 Card-prayer of Merciful Christ of Vilnus with the back le chapelet à la Miséricorde Divine. Sold per quantity of 50. Card-prayer of Merciful Christ of Cracow with the back le chapelet à la Miséricorde Divine. 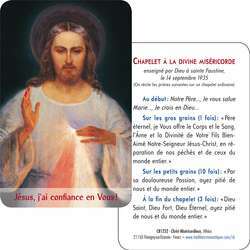 Sold per quantity of 50.
with the back le chapelet à la Miséricorde Divine. Sold per quantity of 50. 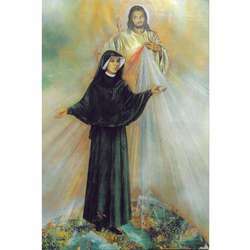 ... model that Saint Faustina contemplated during an apparition on February 22, 1931. 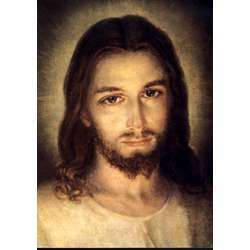 This request of Our Lord will be realized in 1934 with a first painting painted by Eugène Kazimirowski under the direction of Sister Faustine Kowalska herself. This picture is the only one to have been painted during the life of the saint; therefore it can be considered as the authentic painting that deserves our preference. This icon is called the Table of Jesus Mercy of Vilnius because of the place where it is currently. 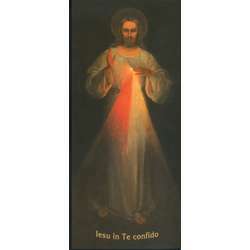 In 1943 a second painting was painted by Adolphe Hila and is currently in Krakow hence his name Table of Jesus Mercy of Krakow. 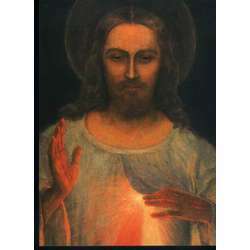 The main difference with the first is at the level of the gaze: in the painting of Vilnius Christ has his eyes lowered while in the icon of Krakow Christ looks at us. 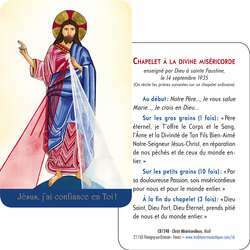 Christ said about his look: "My look on this icon is the same as I had on the cross". Due to the vicissitudes of war and communist persecution, the first painting, that of Vilnius, remained hidden for a long time. 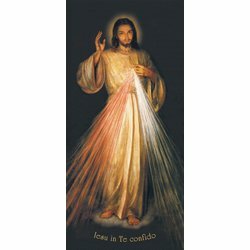 Because of this, the best known is the painting of Jesus Mercy of Krakow which is currently on the same altar as the relics of St. Faustina in the Church of the Convent of the Sisters of Our Lady of Mercy in Krakow. 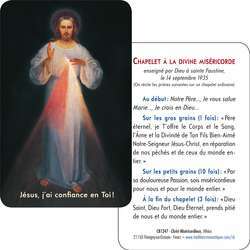 But the devotion to Sister Faustina's merciful Christ is not limited to this holy icon. 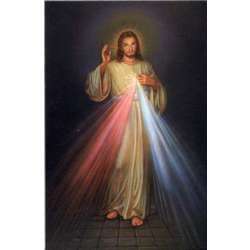 Jesus gave us, through his privileged messenger, Saint Faustina, the Rosary of Mercy. 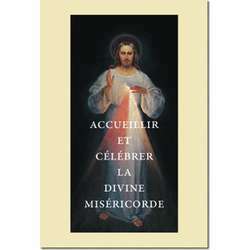 Our Savior has promised extraordinary graces of conversion, especially for the dying ones. So let us spread this devotion with the help of the prayer cards, with the merciful Christ on one side and the text on the rosary of mercy on the other. 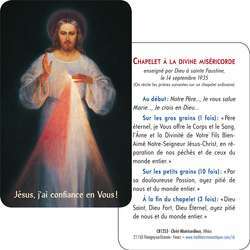 Remember to give these prayer cards, to deposit them in the churches (better with the permission of the parish priest), to "forget" them voluntarily. 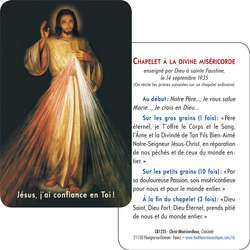 To learn more about this beautiful and great devotion, you can visit the site devoted to message of Saint Faustina .